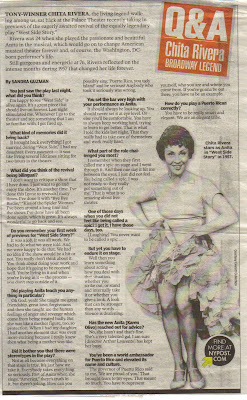 Sandra Guzman talked to Chita Rivera, the original Anita of West Side Story in yesterday's New York Post. The take-away from the online version: "There's an amazing musical, "The Visit," we did last summer and I'm working on getting it up in New York." That's great to hear. I'm glad she's working on it. Keeping my fingers crossed.